Whether you're a seasoned athlete, a weekend warrior, or totally laid-back when it comes to exercise, knowing how to protect your knees from damage can mean the difference between a fulfilling lifestyle and longterm, strained mobility. Bound by an intricate system of ligaments, tendons, cartilage, and muscle, the knee is highly prone to injury. It's a complex hinge where the femur (thigh bone), tibia (shin bone), fibula (next to tibia) and kneecap all come together. Ignoring Knee Pain - When the pain limits your ability to do what you normally do, you need to have it checked out. Being Overweight - Every pound of body weight yields five pounds of force on the knee, so even 10 extra pounds can put a considerable load on those joints. Not Following Through with Rehab & Rest - The rest and rehabilitation period after a knee injury is critical to avoiding future pain or reinjury. "During the rehab period, you need someone to help you tell the difference between something that just hurts, and something that's going to do you harm,” says Dr. DiNubile of the American Academy of Orthopedic Surgeons. Neglecting you ACL - Women in particular have a 2-8 times higher risk for ACL tears compared to men, mainly because the way women naturally jump, land, and turn. However, male and female athletes alike can be trained to "rewire” themselves and thus lower risks of knee injury. 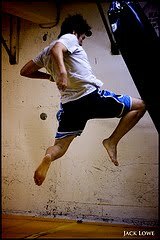 That's done through neuromuscular training, which involves supervised practice in improving agility, leg strength, and jump-landing techniques for better knee joint stability. Seek help from an athletic trainer or other trained professional to help avoid this debilitating injury. Overdoing It - You make gains in fitness when you work hard and then allow your body to recover. You can't do a hard workout every day, To avoid breaking down from ramping up too hard, don't increase your level of physical activity by more than 10% each day, DiNubile says. Be sure to include stretching exercises before and after working out. And follow hard training days with easy ones so your body can recover. Overlooking other Muscles around the Knee - Weak muscles and lack of flexibility are primary causes of knee injuries, according to the Mayo Clinic. When the muscles around the kneecap, hip, and pelvis are strong, it keeps the knee stable and balanced, providing support by absorbing some of the stress exerted on the joint. 0 Response to "6 Ways to Ruin Your Knees"